Happy Memorial Day! While we were supposed to be kicking off the unofficial start to Summer in Montreal, that trip will have to be rescheduled since Noah got sick. Noah was diagnosed with the coxsackie virus earlier last week, and while he has been feeling and acting fine, we didn't want to risk infecting anyone (or get dirty looks from strangers). So while our weekend was more low key than originally planned, it gave me some time to think about what I want to do as a family this summer! I have so many ideas and think that at Noah's age (3.5), there's great potential to have our best summer yet! While this bucket list was made with our family in mind, it list can easily be adapted for anyone. A mixture of excursions, outdoor (and indoor) activities, as well as some adult only fun (hello cocktails!). 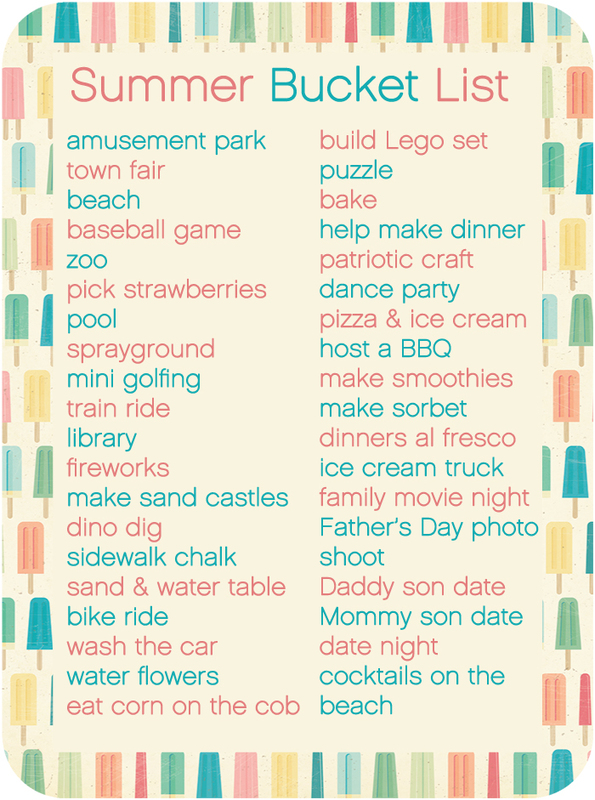 What do you have planned for the summer??? All the heart eyes for the Father's Day photo shoot! Youre going to have so much fun checking items off your list. The popsicle background made me smile. This list looks glorious! Picking strawberries is something I for sure want to do. We've never done it before. I love the image you used to make your list! Wow!!! Sounds like you guys are going to have a BUSY yet amazing summer! Can't wait to see how all these activities play out! Your list is so full and so perfect! I love it. You guys are going to have such a great summer! I love that you were heading to Montreal! Not so much that it got cancelled though. I hope Noah feels better asap and that you're able to come to Canadaland soon! So fun!! Summertime is just the best! Yay! You know that I am such a big fan of bucketlists. I love to see what others put on their lists! So many fun things on your list. I love that you put ‘eat corn on the cob’ on your list. That is one of my favorite things! We had some while camping this weekend and it was amazing. Can’t wait to follow along as you mark things off your list. Bummer for unexpected, change of plans. I love this image!! And your list of course. I made our Bucket List a bit small this year because there are a few things I want to squeeze in depending on time/weather/desire. Sometimes I have to watch how much we push on Connor or he starts getting frazzled.